5 | 378 students enrolled. 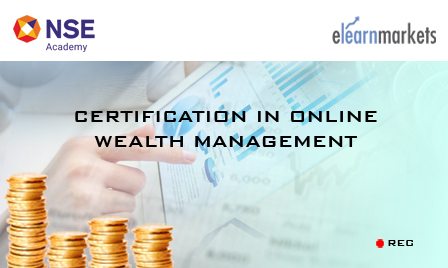 Certification in Online Wealth Management course is jointly certified by NSE Academy & Elearnmarkets (NSE Academy is a subsidiary of National Stock Exchange of India). The Financial system acts as a reflection of an economy. The increasing integration with the global markets has lead to a swift rising of the financial sector in India. Wealth Management has developed into one of the most respected and highly compensated occupation in the financial services industry. Globally, the financial advisers have emerged as the most recent class of experts who either as entrepreneurs or as working professionals in banks or other investment advisory firms create financial plans for their clients and also help them to accomplish their financial goals. This perfectly designed comprehensive course will aid you in understanding your financial goals and also enable you to increase, maintain and conserve your wealth. To be able to respond to the challenges brought about by the altering nature of the Financial Services Sector. Students enrolling for Certification in Online Wealth Management course will be given a “Certificate of Participation” from NSE Academy,facilitated by Kredent Academy. The students can take the help of an email query support, Question and Answer Community Platform for any kind of doubt clearance related to content while pursuing the course. They will also learn how to do financial planning calculations in MS-Excel. In addition, they will be given exposure to certain mutual funds websites, insurance websites and other economic websites and they will also learn how to extract and use data in a selective manner for creating wealth. After successful completion of the online examination, participants can download their certificate from "My Certificates" tab available on Elearnmarkets dashboard within 10 days from the date of Certificate application done.